The IPC Academy Campus will take place in Rio de Janeiro between 6-17 September 2016, giving stakeholders of major sports events the chance to learn from their peers during the Paralympic Games. Delivered by the IPC Academy - the educational division created in 2009 as a partnership between the International Paralympic Committee (IPC) and the World Academy of Sport (WAoS) – the 2016 IPC Academy Campus is a unique event-based learning initiative that will include an Observers’ Programme, Games Experience Programme, Inclusion Summit and Closing Cocktail Reception. 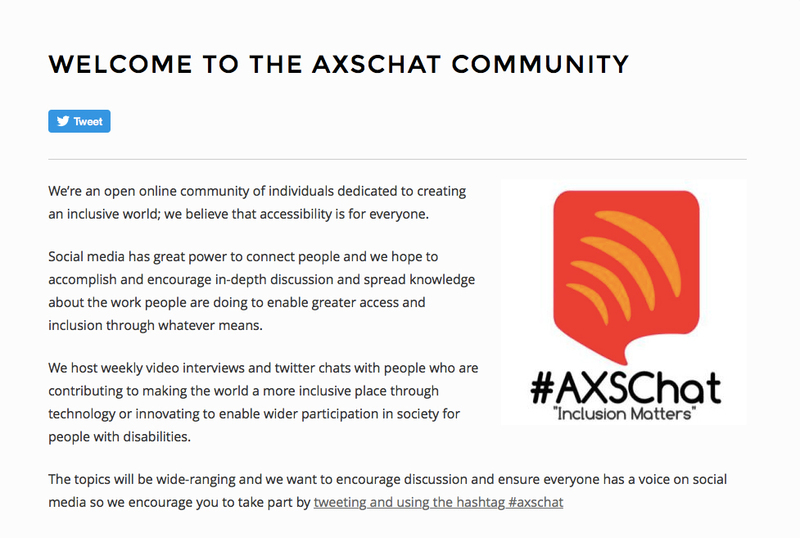 The Social Media Partner of the Inclusion Summit at the IPC Academy Campus is AXSChat, an open online community of individuals dedicated to creating an inclusive world. Here, IPC Academy Campus speaks to AXSChat’s Co-Founder Neil Milliken, about how the community has leveraged social media to grow awareness of inclusivity issues. Why did you launch AXSChat? “We believe that accessibility is for everyone. Social media has a great power to connect people and we hope to accomplish and encourage in-depth discussions and spread knowledge about the work people are doing to enable greater access and inclusion through whatever means. We believe that AXSChat is a great example of how social media and communication tools allow people to come together and break down silos. We host weekly video interviews and twitter chats with people who are contributing to making the world a more inclusive place through technology or innovating to enable wider participation in society for people with disabilities. “We created AXSChat because we wanted to broaden the conversation about ways society can benefit from accessibility and inclusion of persons with impairments. In the beginning, myself and my fellow AXSChat co-founder Antonio Santos reached out to Debra Ruh to propose a partnership to create a weekly chat to help engage all stakeholders in conversations with a goal being to help break down barriers. People often consider accessibility to be a narrow technical issue and we know that it is much wider. Our goal was also to give persons with impairments a bigger voice on social media. “Each of the founders has personal stories that connect us to the community of persons with impairments, either physical or learning. Debra has a daughter with Down’s syndrome, parents that acquired physical impairments and two nephews with autism. I am dyslexic and have parents with acquired physical impairments. Meanwhile, Antonio has a wife with fibromyalgia. “Consequently, we are personally connected with the community of persons with impairments and dedicated to raising the profile of talented individuals to ensure that their voices are heard all over the world. Why did AXSChat want to become the Social Media Partner of the IPC Academy Campus? What will AXSChat be doing during the Inclusion Summit at the Campus to encourage debate? How important is the subject of inclusivity to the sports industry and indeed other sectors? Do you think people are getting better at embracing inclusivity generally? Is the sports industry better at being inclusive than other industry sectors in your opinion? What would be your advice to organisations in any industry looking to improve their inclusivity policies and procedures?